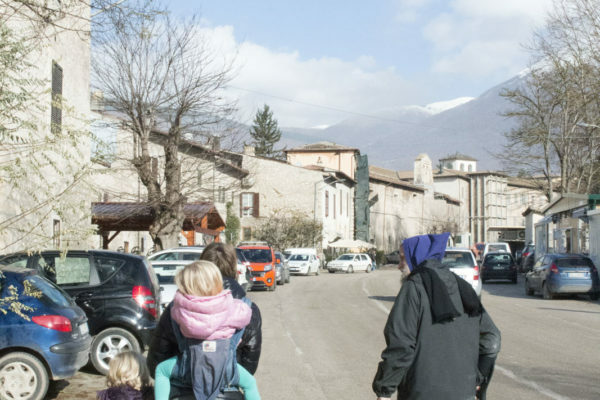 In 2016 an earthquake and aftershocks crumbled many parts of the town of Norcia. Norcia is birthplace of Saint Benedict, founder of Western monasticism. 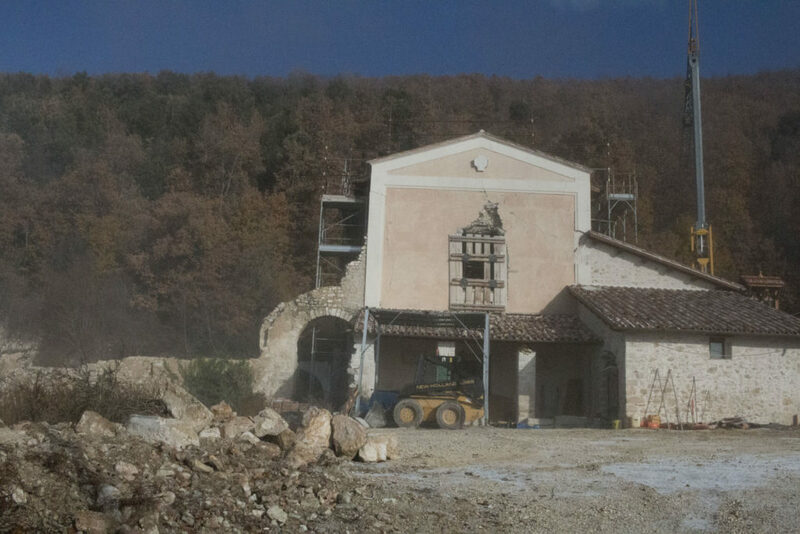 The Monks of Norcia and their rebuilding become symbols of hope in the Catholic church. 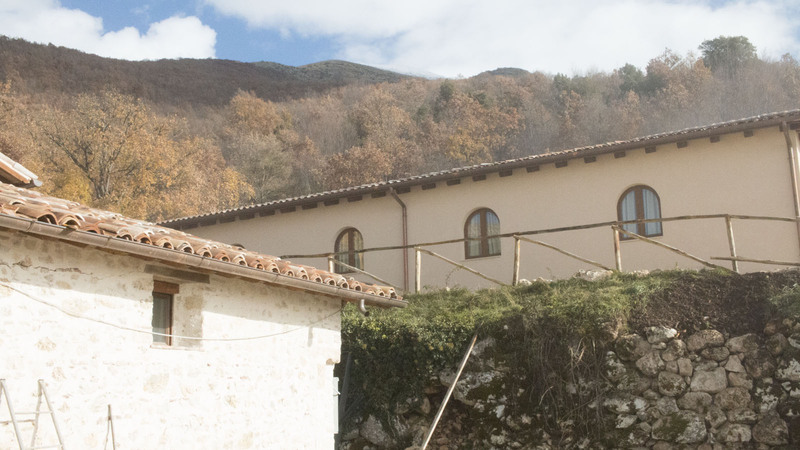 In November 2017 we visited the Benedictine Monks of Norcia in their new monastery on the hillside above the ancient town. 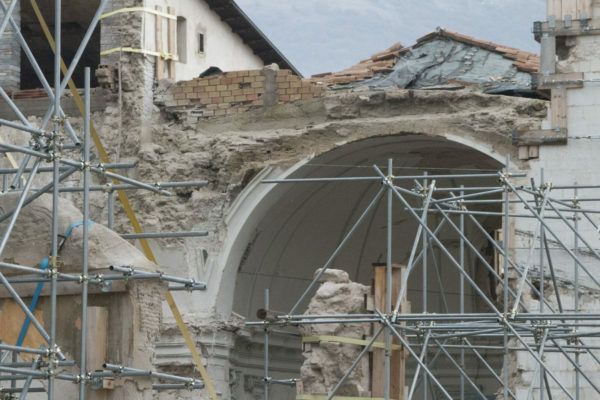 The Monks moved outside the city walls after the earthquake of 2016 crumbled their monastery and the Basilica of Saint Benedict. The Monks of Norcia and their crumbling become symbols of hope in the Catholic church. Looking back on our visit to Norcia in 2017, I feel like the images I saw there are representative of news in the Catholic church the last couple years. The scandals of abuse of power and sexual misconduct have rocked the foundations of much of what seemed powerful and permanent in the Catholic Church. Structures that seemed impenetrable have proved shaky, and institutions which promised protection have crumbled, untrustworthy. 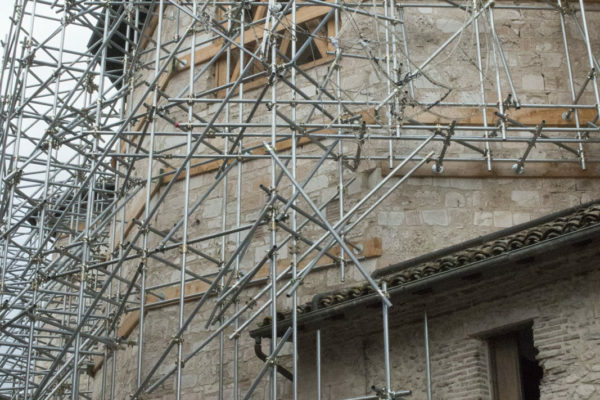 Can the Monks of Norcia teach us something about rebuilding? Norcia was the birthplace of Saint Benedict and his sister, Saint Scholastica in the late 400s during the Late Roman Empire. 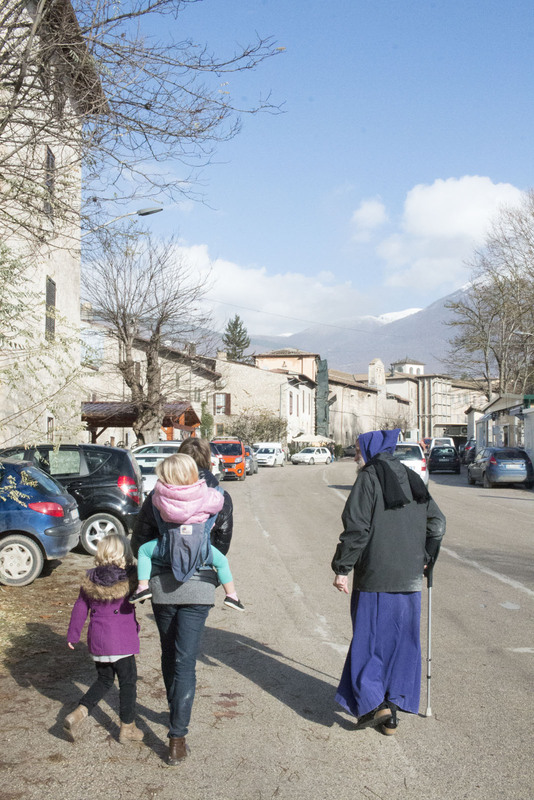 In Norcia and across Europe the Benedictine model spread and many towns became home to multiple monastic communities. In 1810 Napoleon closed many monasteries across Europe, and the monastic community in Norcia fled. For nearly two hundred years there had been no monks there. Widely credited as the founder of Western monasticism, Saint Benedict combined spirituality and practicality in his guide for monastic life, “The Rule of Saint Benedict”. The success of his communal experiment preserved classical learning and Christian faith through the chaos and upheaval of medieval Europe. 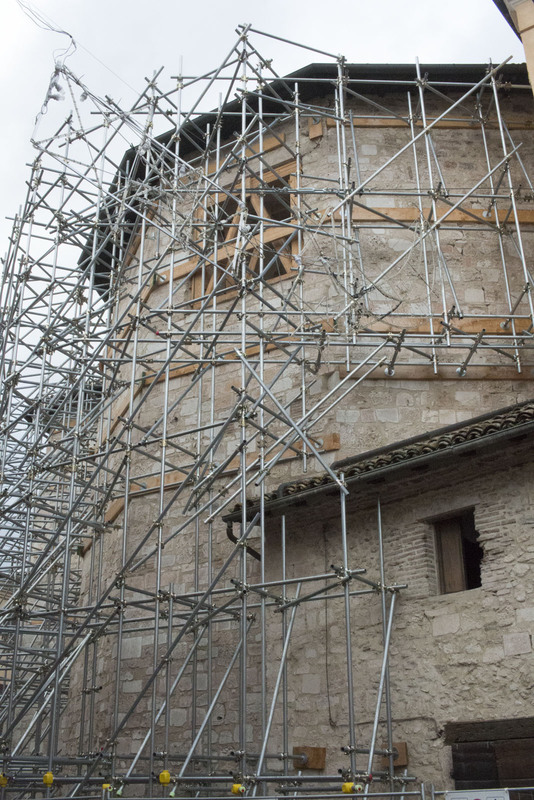 In a cultural sense, the Benedictines have always know what it means to rebuild. In the year 2000, Father Cassian Folsom and a group of American monks re-established a monastery in Norcia. They renewed the Benedictine rhythm of work and prayer in the birthplace of the patron saint of Europe. From the start, these men were called to re-build centuries-old monastic tradition in its birthplace after a long absence. Why did they return there now? I think we are finding out. 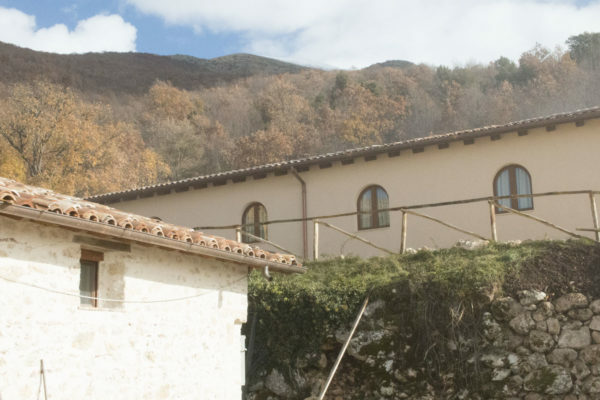 In a small pre-fab monastery being added to stone by stone in the mountains of Italy, there are men who are practicing prayer, fasting. Their rhythm of work and prayer (“ora et labora”) is radically opposed to our 21st century lifestyle, including many inside their own Catholic Church. In Lent and Advent the monks eat one meal a day. The self-restraint they develop from fasting in “small” things allows them to fully embrace God’s will. But is it so small? Few of us are willing to sacrifice to the level of one meal a day: perhaps self-denial and self-discipline does not discriminate between “large” and “small” sacrifices. Perhaps they will be able to show us something about re-building holiness. ”Here is a community of men seeking God through prayer and fasting. They are re-building old churches stone by stone with their hands. I pray they are also re-building our church with their prayers. The earthquake is why we are here visiting. I spent much of 2017 working on a painting of the Basilica of Saint Benedict as it was before the earthquake. 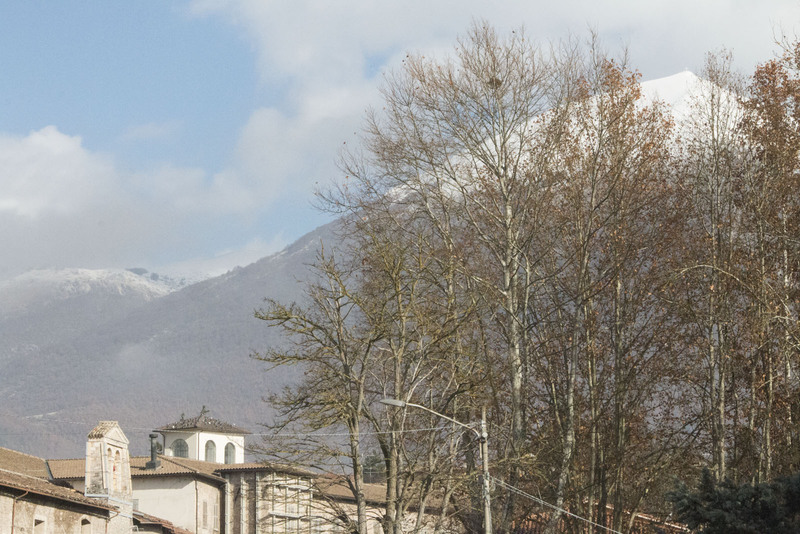 Through the introduction of the patrons, I got to know the Monks of Norcia and their story. On this trip to Italy I wanted to visit the Monks in person and the place I had spent so long studying only from photographs! 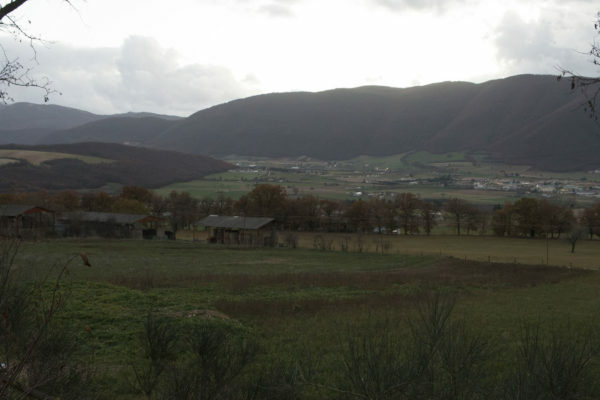 We drove to Norcia on winding mountain roads from Assisi, arriving at our Agriturismo Tana dei Lupi just at dusk. We were grateful to arrive before dark, as we had a hard time finding just the right country lane. The roads the final half-mile were very rough with potholes still not repaired after the earthquake. Upon arrival I walked around the property to find our hosts. The building across the one lane road was crumbled to its foundations. The building just up the hill from the lobby partially collapsed, with vertical cracks in the remaining walls. I finally found the proprietors in a trailer. As a result of the earthquake their home is uninhabitable and the trailer is their home. 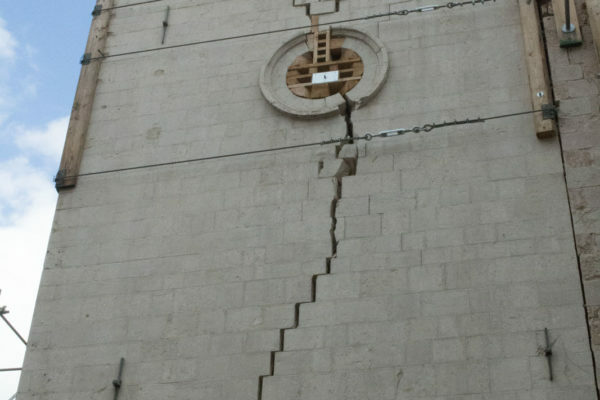 Fortunately, though the building that houses their Bed and Breakfast came through unscathed thanks to its ancient barrel vaulting. 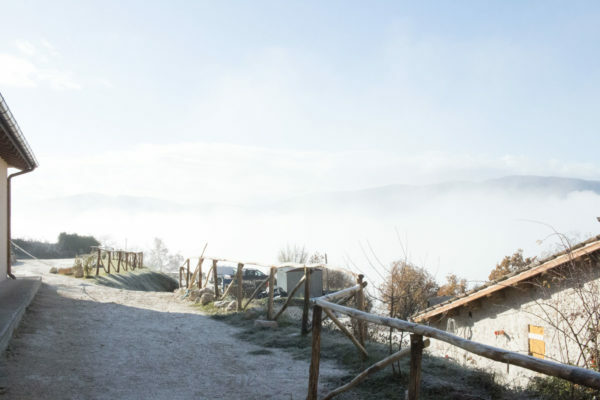 The home of the owners of Agriturism Tana dei Lupi in Norcia, Italy. The next morning, after a breakfast of homemade tarts and home-cured prosciutto at our agriturismo, we headed up the hill to the monastery to attend Mass with the monks. View of the Norcia valley from the hillside monastery of the Monks of Norcia. 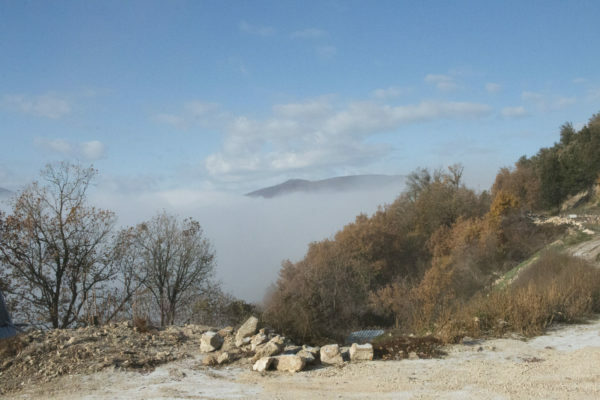 Their new monastery overlooks the valley and the ancient city (covered in fog that morning). Here they are building new quarters for themselves, but also re-building a 17th century monastic church which has stood here for centuries. 17th century monastic church now owned by the Monks of Norcia. The morning Mass was in Latin, very beautiful but we aren’t accustomed, so our kids were antsy, especially our two-year-old. Towards the end I had to take her outside where she cried and yelled “I want to go back to church! I want to go back to church!” So holy, no? By the time we returned I had missed communion. After Mass at the monastery, Father Cassian Folsom (the founder of the community) accompanied us down the hill into the ancient town to show us their former monastery and the ruins of the Basilica of Saint Benedict. 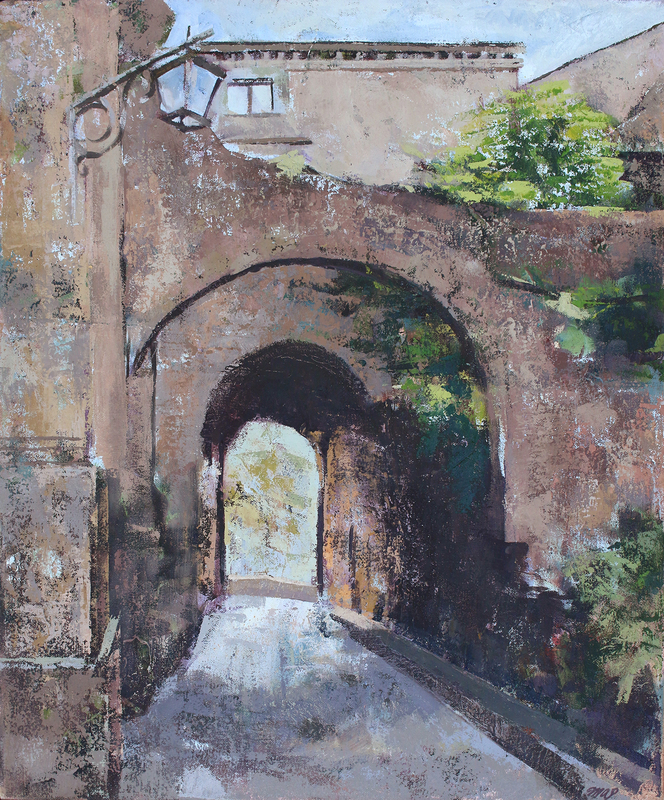 In the process of creating the painting I enjoyed getting to know my patrons, one a new oblate of the Norcia community. They introduced me to Fr. Cassian Folsom in person at a fundraising event for the ruined monastery. Over the course of the project I began to see and appreciate the beauty and strength of the monks call to return to Norcia and remain there. The patrons who commissioned the painting of the Basilica of Norcia had provided me with photos to work from. Even if I had been able to visit the site in person, it would not have helped. 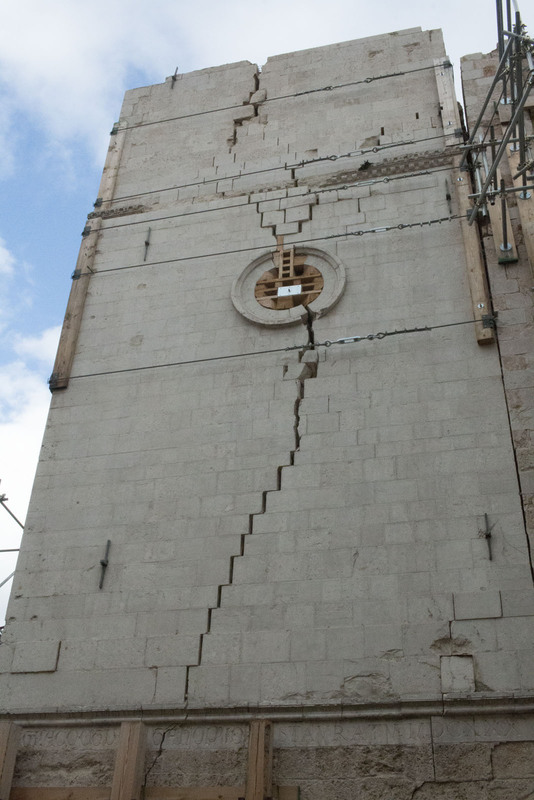 The Basilica’s roof had caved in the aftershocks, the belltower partially collapsed. The basilica as it appears in the painting has been destroyed. 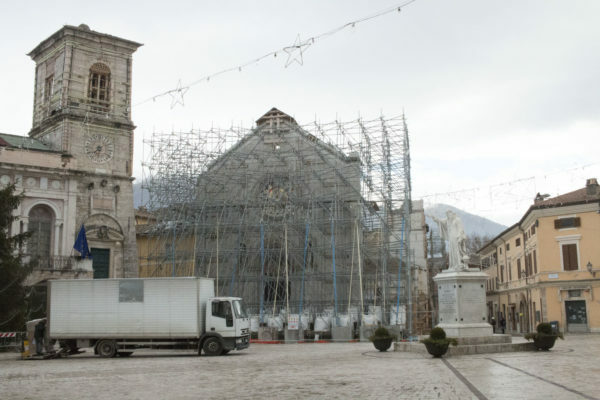 Here is a photo of the Basilica of Norcia in its current state as it best matches the painting I was commissioned to create, depicting its appearance before the earthquakes. 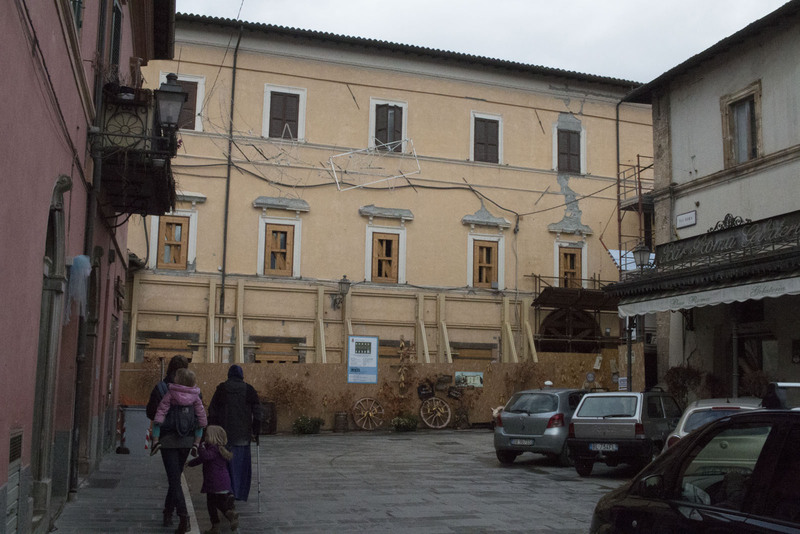 As a result of the earthquake, the facade is barely held intact by scaffolding. 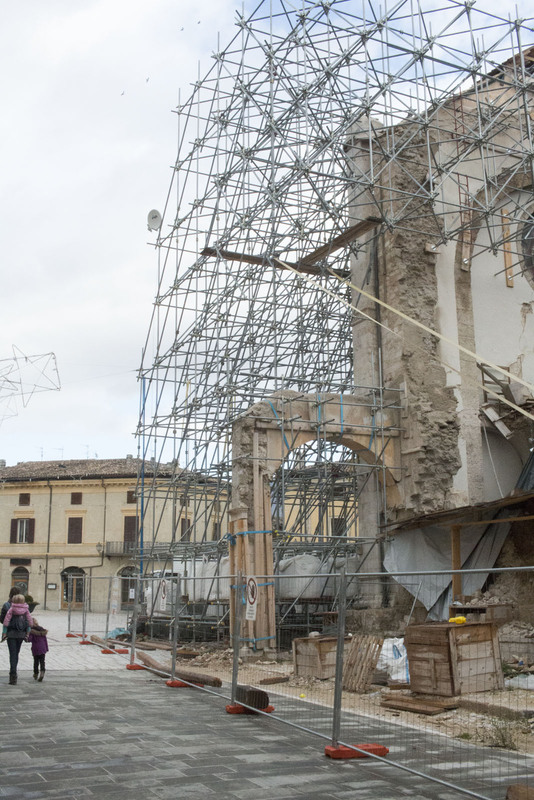 the belltower on the right side has crumbled, and the roof of the basilica is completely collapsed. 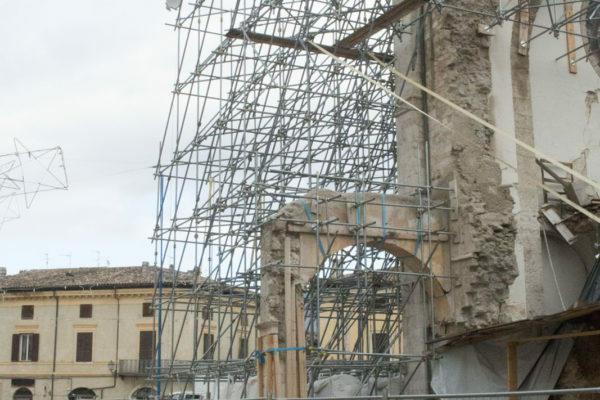 Now in 2019, years after the first earthquake, the Monks of Norcia’s call to re-build culture and tradition (now literal as well as metaphorical) seems even more courageous and ambitious. In recent months, as the scandals of abuse of minors and abuse of power come into the light, the people of the Catholic Church are disheartened, disillusioned, disappointed, discouraged and disgusted. 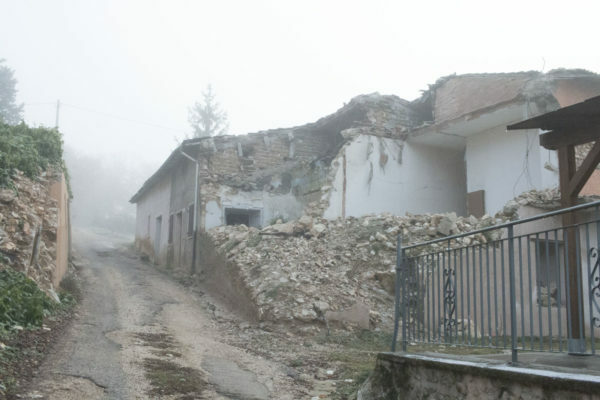 The scandals (the grand jury report in Pennsylvania, the letter by Archbishop Vigano revealing complacency and cover-up at the highest levels of our Church) have shaken us much like the earthquake in Norcia shook that community two years ago. I know many who feel shattered – everything we thought was solid, the mortar and stone of centuries, appears to be crumbling and fragile. 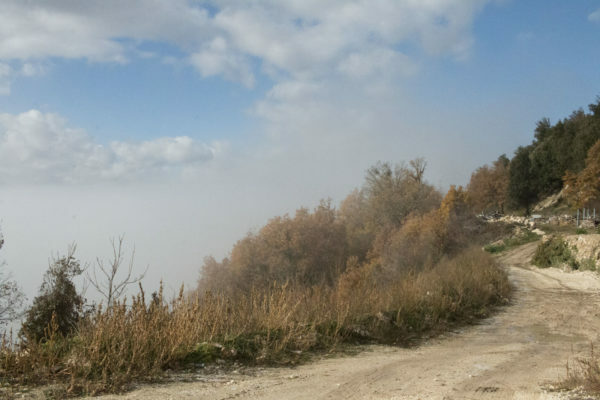 “Can anything good come from Nazareth?” people asked when they first heard of Jesus. A lot of people are asking the same about the Catholic Church right now. Can anything good come from somewhere so tainted? Patron Saints of Re-Building the Church? 800 years ago God asked Saint Francis to rebuild a tiny church called San Damiano in the midst of an age of church corruption. 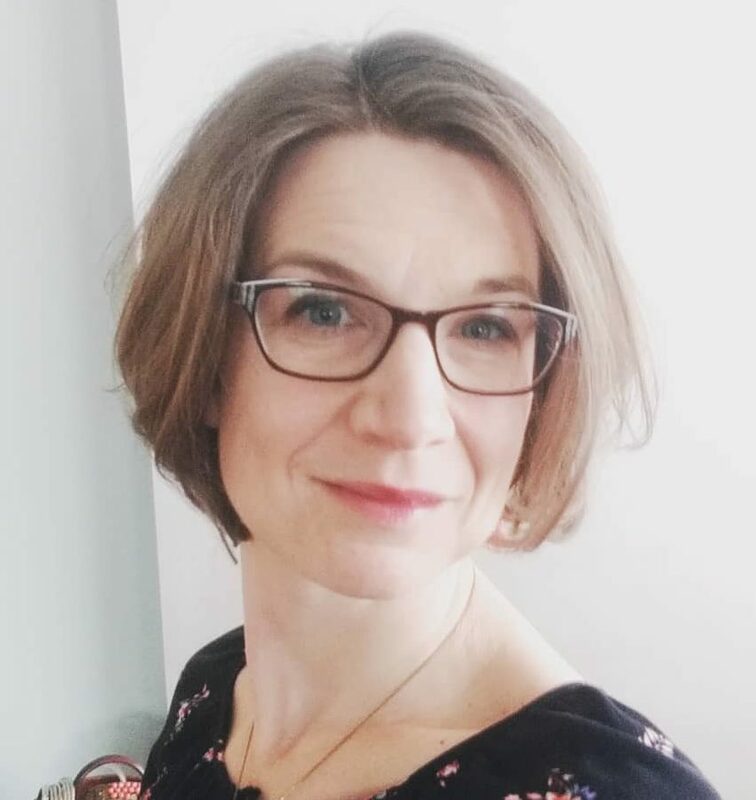 That story ended with a return of the whole church – laity and hierarchy to the core of the Gospel message of the simplicity of love. 1300 years ago God asked Saint Benedict to gather around him some young men to create order in the midst of chaos of a crumbling Roman Empire, and through men and women living in radical community Christians brought hospitals, education, help and healing to the people of Europe through centuries of uncertainty. It just takes one person answering a call to holiness, to spiritual reconstruction – in order to inspire a tidal wave of renewal. Here is a community of men seeking God through prayer and fasting. They are re-building old churches stone by stone with their hands. I pray they are also re-building our church with their prayers. 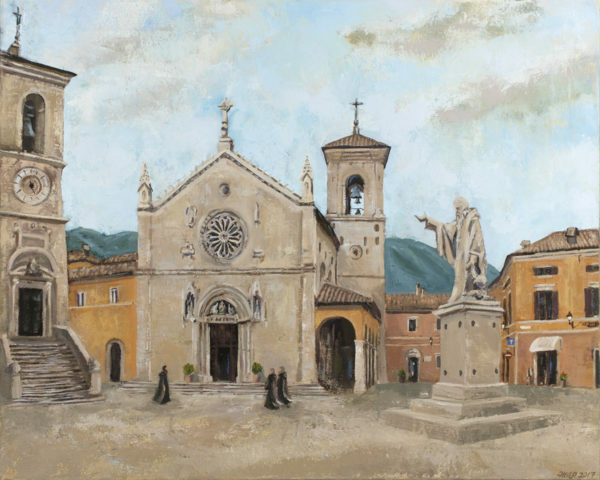 A portion of the proceeds from each Norcia Basilica print sold goes to support the rebuilding efforts. Looking for More Inspiration in Your Inbox?